On Wednesday, the U.S. Air Force revealed in a press release that B-52 bombers were flying coordinated missions from Indo-Pacific, home to tensions between America and China, and Europe, where United States-Russia hostilities remain alive and well. Collectively, the flights from the Indo-Pacific and Europe demonstrated U.S. commitment to allies and partners through the global employment of military forces. The U.S. deployed B-52s the Indo-Pacific as China militarizes man-made islands and continues to engage with territorial disputes with American allies in the area’s South China Sea. Russia also has an interest in the region. Early this month, Gen. Curtis Scaparrotti, the U.S. European Command (EUCOM) head and NATO’s supreme allied commander in Europe, painted a grim picture of America’s standing ability to credibly deter Russian aggression in the region, noting that Moscow’s efforts to modernize its armed forces are eroding the United Sates’s military advantage in Europe. America’s B-52 deployments came as Russia celebrated the fifth anniversary of its annexation of Crimea from Ukraine, which has triggered a war between Kremlin-backed separatists and forces loyal to the Ukrainian government that has killed and wounded thousands, CNN noted. The U.S. nuclear-capable deployment further fuels ongoing tensions between Russia and the United States, the state-run TASS News agency reported Thursday. China has also warned against the naval presence of the U.S. and its Western allies in the South China Sea. Last week, Gen. Curtis Scaparrotti stressed the necessity to keep tabs on Russia-China military cooperation in Europe. Under Trump, the U.S. is mainly prioritizing combating America’s strategic competitors, Russia and China, while keeping the pressure of lingering jihadi groups. The B-52 is in the process of undergoing upgrades to make the subsonic heavy bomber that remains the mainstay of America’s strategic fleet after more than 50 years of service more lethal. 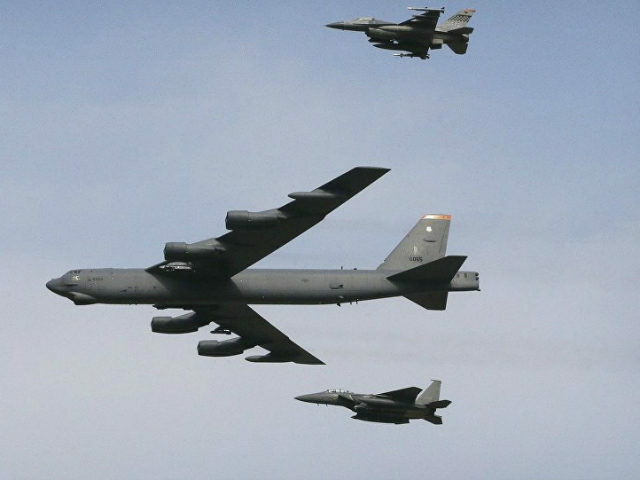 Relying on Boeing, the U.S. Air Forces is seeking to equip the B-52s with Long Range Stand-Off (LRSO) Cruise Missile and allow them to carry more smart bombs as part of what top military brass considers much-needed upgrades expected to cost up to $11.9 billion over eight years. However, as of this week, no funds have been approved for the modernization, which the U.S. military believes falls behind China and Russia.